Difference between revisions of "April 16, 2018"
The Agricola Mountains is a peculiar and unexplained lunar formation. It is long, narrow and slightly curved so that its western end is closer to the Aristarchus Plateau than is its eastern end. That end is broader, appearing to be made of an elongated cluster of peaks. 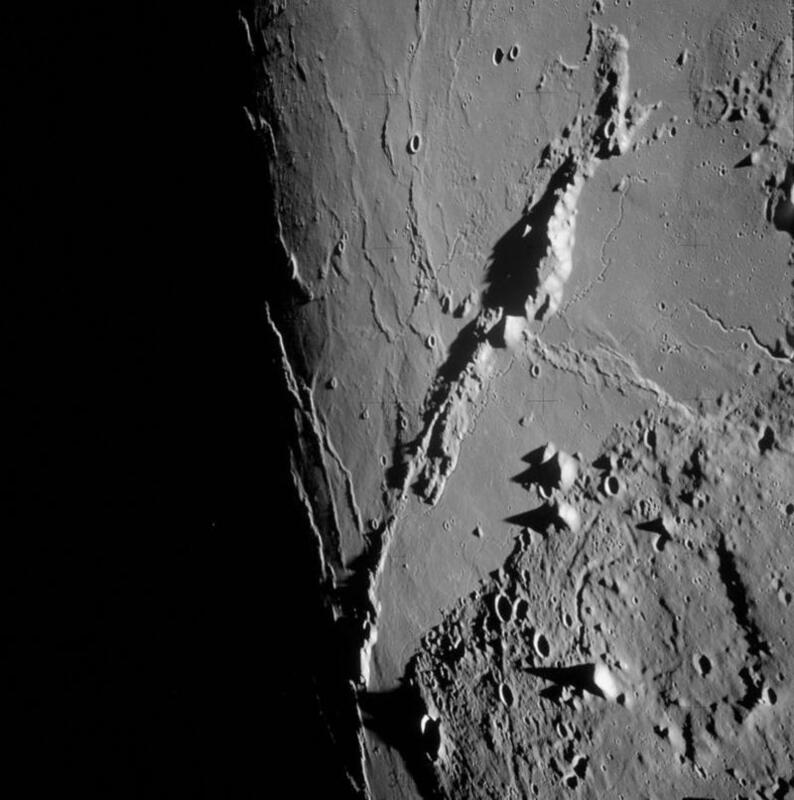 Interestingly there is small, cratered plateau along the ridge crest, suggesting that the peaks may have once been part of a more extensive surface; but it does not match the nearby Aristarchus Plateau. The middle length of the Agricola Mountains is very narrow and spine-like - no one knows why. A low broad dome butts against the middle of the northern side mountain range, and lower Sun views show it to be more densely cratered than surrounding mare, and hence older. Clementine multispectral and ratio images show that the dome, and more surprisingly, the Agricola Strait - the lava between the mountains and the Aristarchus Plateau - have colors that match the Plateau. This implies that the dome and the Strait lavas are covered by the pyroclastics that erupted from Schröter's Valley and drape the Plateau. But the surrounding maria are not. I am confused, for the Strait lavas have fewer craters than more distant lavas and I would think they are younger. Perhaps Paul Spudis or some other Clementine expert can help resolve this perplexity? McEwen et al (1994) Clementine Observations of the Aristarchus Region of the Moon. Science 266, 1858-62.